A participant of a training programme on fire prevention and fire control measures receives a certificate at FBCCI auditorium in the capital on Sunday. A training programme on fire prevention and fire control measures in the industries and household units was held at FBCCI auditorium in the capital on Sunday. 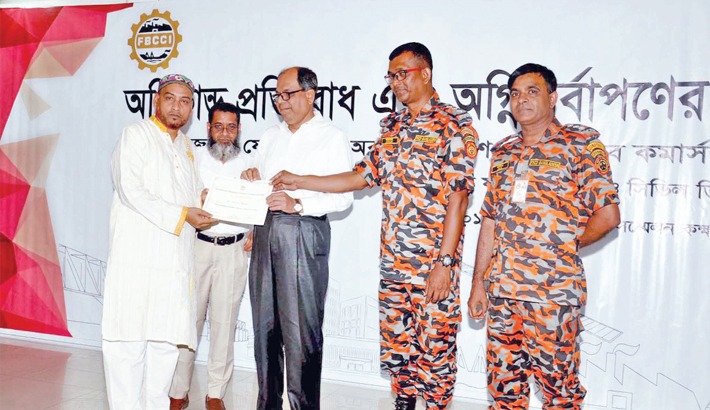 Federation of Bangladesh Chambers of Commerce and Industry (FBCCI) in association with the Fire Service and Civil Defence (FSCD) organised the programme, says a press release. About 30 participants from Bangladesh Chemical and Perfumery Merchant Association, Bangladesh Paints, Dyes and Chemical Merchants’ Association and Bangladesh Plastic Packaging Roll Manufacturers Owners Association took part in theoretical and practical training. The participants were trained in three sessions in the programme. Later, a practical demonstration of fire control was also held on the adjacent playground at Mohammedan Sporting Club of Motijheel. It may be mentioned that FBCCI is working for a long term solution of fire safety risks after the devastating fire incident in Churihatta of old Dhaka on February 20. FBCCI is working relentlessly with the Dhaka South City Corporation, Fire Service and Civil Defence, government parties and the old Dhaka associations.